The tray that our flight attendant serves us with a smile is an extremely well thought out meal plan where every gram is a result of a well researched scientific process. Hop On and Hop Off had the opportunity to attend Vistara’s Summer Menu tasting session and go behind the scenes at TajSATS Air Catering Ltd. (A joint venture of the Taj Hotels, Resorts and Palaces and SATS, formerly known as Singapore Airport Terminal Services) to understand what an effort it is to serve the meal of our choice at 30,000 feet. Put simply, Vistara serves about 10,000 meals a day and almost 70,000 meals per week. Business class meals weigh around 300 grams and economy class weigh approximately 220 grams and this does not include soft drinks. Tea/coffee and juices weigh about 80–100 ml and water is 200 ml. 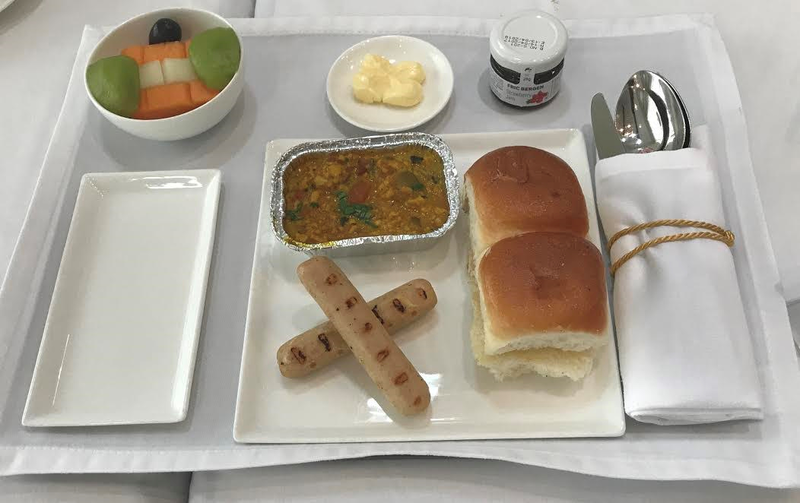 If it already sounds too daunting an effort on ground, what makes this daily exercise done with clockwork precision nothing short of a marvel is that these meals are served within flight times and across the country at that altitude. 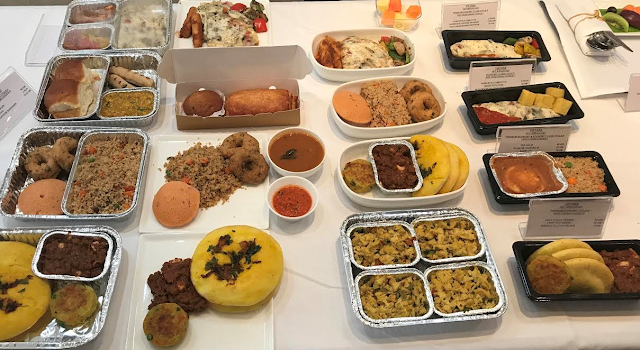 The airline serves 200 different types of meals in a day and does it in four rotations of menu in a day — Breakfast, snacks, lunch and dinner. Since, we only get to see the tray that is put in front of us, we thought why not take you behind the scenes of how this tray is made. Your complaints, compliments and even untouched items form a part of the constant feedback process to understand fliers expectations from their in-flight meals. Even though the menu changes only twice a year, Vistara spends almost 3–4 months in preparation for this change. The process is aimed at providing the best possible meal experience to suit a flier’s needs. It also needs to taste well despite it being cooked on ground and being served at an altitude where on an average we lose about 40% of our sense of taste. We visited TajSATS’ Delhi plant to see where and how the in-flight meals are put together. TajSATS is the catering company behind most of the airline meals served aboard major domestic and international airlines. Cleanliness and safety are of prime importance as you will see all the staff wearing surgical coats, caps and gloves. The production floor looks like a large catering kitchen, demarcated into different zones for different activities. One end of the floor is the receiving gate where all the raw materials are sourced and collected from. The other end houses the delivery gates with the parked trucks connected by walkways similar to the airbridges found at the airports. The security is quite high at the facility and everything is closely monitored and controlled from the facility control room through CCTV cameras to watch over every corner of the building. Once the raw materials such as meat, fruits, vegetables and packaged products are received, they are scanned by a huge X-ray machine and bundled off into their respective areas. The fruits and vegetables are first cleaned and sanitized in 5% Chlorinated water. These are then clearly labelled day wise in the respective colour to ensure the older produce is used first. The meats are cleaned, washed and cut on specific colour coded chopping boards to be packed off into the deep freeze. They are taken out on the day of cooking to avoid microbial activity. The dry packaged goods are sent to the store where they are again distributed into refrigerated items, liquids and solids. The butters, cheeses, jams, etc., are put in the walk-in refrigerator while the liquids do not need any processing. The rice, pulses, quinoa, etc., are opened to be sieved out to ensure no adulteration with pebbles, etc. The store holds about 10 days’ worth of stock and produce, all date coded, along with other airline equipment such as cutlery, china, dishes, meal carts, cushion covers, headphones, etc. Then starts the cooking floor where signs clearly mark out the bakery, patisserie, halwai, cold kitchen, vegetarian and non-vegetarian hot cooking, packaging and distribution. There are rows upon rows of stainless steel benches where workers and chefs assemble and cook various dishes. The meals are prepared 12 hours ahead of flight time, fruits and cold cuts are prepared 6 hours ahead and the trays are set 4-5 hours before a flight. There are three menu cycles and they are changed every 6 days to ensure that regular customers are not bored. The menu also varies according to the region that the flight is taking off from and also flying in to. There will always be a dish from each region to ensure that the menu caters to the entire passenger mix. India is a country of several religious and dietary diktats and the menu always has special meals such as vegan, Jain or festive meals on occasions such as Diwali, Christmas, etc. The whole set up is headed by the Executive chef Arun Batra and each section is run by a head chef with sous chefs underneath them like a restaurant kitchen. The bakery portion was our favorite with the smell of freshly baked bread making our mouths water and our knees weak. The bakeries at TajSATS are nothing short of wonder as they run with such extreme precision to deliver mass numbers of croissants, bread rolls, patties, and other confectionary goodies. In fact, they even bake all the goodies you get at your neighborhood Starbucks outlets across India. The bread for airline meals has to be made a bit differently with less butter to keep it softer and less dry for the air up there. 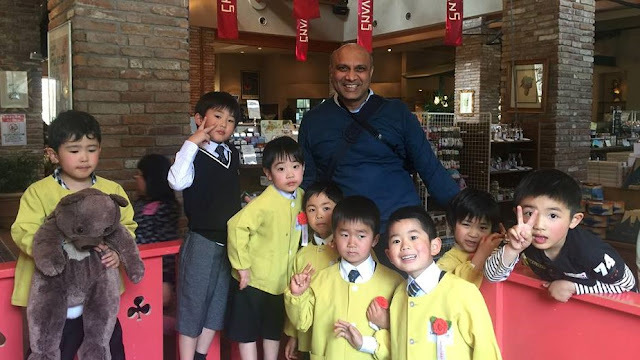 The bakery is run by an industry veteran Arun Guwalani, Chef Patisserie who has over 30 years of experience and has been with TajSATS for over 20 of those years. The patisserie is where all the pastries come together while the halwai section churns out Indian desserts in bulk. The hot kitchen is clearly divided into vegetarian and non-vegetarian sections to ensure there is no mixing. Maintaining the flavors in spite of the sheer volume of food cooked so far ahead of time and the temperature constraints due to blast chilling, warming, packaging and rewarming are the biggest challenges of the hot kitchen. A lot of muffins and croissants that your enjoy at Starbucks are prepared here! Heating, Blast Chilling and Heating Again! All the prepared food is blast chilled in a walk-in freezer to kill all microbial activity. Once, the food is chilled, it is taken out and portioned before storing it in the food bank at a conducive temperature. Food portioning is critical as the food is carefully measured by weight to match airline budgets and customer satisfaction. The food is then pre-plated as per airline specifications into handy meals which are then placed onto trays. A group of workers is constantly assembling and flow wrapping the cutlery. The loading of economy trays is done in the assembly section through a production line set up to ensure maximum efficiency. Business and First trays are loaded manually by individuals. The trays are placed onto trolleys and transported along with cutlery to the trucks. These trucks have refrigerated HI loaders that store the food on the way to the aircraft. All trolleys are filled with the necessary number of trays even if lesser number of passengers are traveling so as to keep inventory and to return the correct number of equipment once the flight lands. This is called dead heading, errr sounds rather cold doesn’t it? The distribution area has clearly labelled signs for each of the airlines with familiar meal trolleys ready to be loaded up. Since, there are several flights leaving around the same time and each has a different passenger load and meal requirement basis the time and destination of flight, the distribution team has to plan it down to a T.
3 to 10 workers travel with the truck to the airport to load the plane depending on the size of the aircraft and have only 15-20 minutes to do so. The entire process from pre-plating till loading the aircraft takes up to an hour keeping in mind the time required for security checks at the exit from the building and at the airport itself. So the next time you complain about the airline food being dodgy and unrecognisable, think about the science of getting it up there. It’s clearly nothing short of miracle! Interesting read, and well researched! If you ever plan to visit Vietnam, I recommend you to check out the Green Visa! They are one of the best tour guide service providers there are. I have personally experienced there services and they are really amazing!